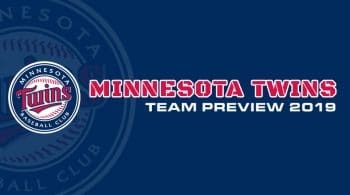 Minnesota is a very exciting team to follow this season, mainly because their offseason moves went unnoticed to the casual fan. C.J. Cron has been a strong power bat from the right side over the last few seasons, and the same goes for Nelson Cruz. Both should continue their power threat in the middle of the order. Surrounding them with names like Eddie Rosario and Jorge Polanco gives them strong on-base guys to help provide some RBI chances. The Twins did not stop there, adding Marwin Gonzalez and Jonathan Schoop to their lineup. Schoop cooled off last season, but we know the type of upside he has. Gonzalez has been a strong utility guy in Houston, and this was a strong landing spot for both sides. If Byron Buxton can bounce back from injury, this is going to be a very deep lineup. The Twins might be another solid arm or two away from being a real threat to the Indians this season. They were in the bottom ten in ERA last season, but that mainly came because of the lack of depth. They added Michael Pineda two years ago, but he missed last season with surgery. Having him back this year would help if he can resemble the same guy that came out of New York. Jose Berrios is the stud arm in this rotation, and he pitched 192 innings last season, which is a big positive for durability. Berrios also showed above average strikeout stuff, but his consistency was the biggest plus of 2018. He will headline this rotation again this season, hoping to push them back into postseason contention. They have added on the offensive side, but are hoping these names can take another step forward. Kyle Gibson upped his strikeout stuff last season, and finished with a 3.62 ERA. It might be tough to ask him to repeat, but these numbers next season would be a big help for this staff. Gibson keeps his groundball rate high, he should be able to duplicate these results. Minnesota signed Jake Odorizzi last season, who played with Tampa Bay in his prior seasons. Odorizzi is a flyball right-hander, who started to even out his splits. He finished with a 4.49 ERA, and struggled more often than not. He is what he is that this point in his career, so expecting sudden change would not be wise. He should flirt with a mid four ERA again, and have some blowups. Pineda is due back, although coming off two major surgeries in the last season, we have to temper expectations. Pineda was a little bit erratic during his time in New York, and we have yet to see him pitch in Minnesota yet. League average numbers seem to be where most of his projections sit for this season. Adalberto Mejia is expected to take a major jump in innings as the number five starter. Not sure this is a huge positive, but the Twins need a fifth arm. Mejia has shown below average strikeout stuff in the majors, and through 122 innings in the major he has a 5.15 xFIP.